Motorola today introduced an all-in-one in-car computer system that runs on Windows Mobile 6, thrusting the mobile OS into the turf where Windows XP and CE reigned. 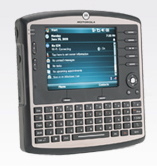 Motorola has introduced its VC6096 dash-mounted mobile computer, designed especially for vehicle-based workforce applications. Emergency and police vehicle systems, though differing from state to state, most frequently run either Windows XP and XP Embedded (PDF available from Glacier Computer for one example) or Windows CE. Of course, Motorola has dealt with in-vehicle computer systems for a considerable amount of time, and units like the MW-520 workstation were often equipped with Windows 98 SE and Win2K. The most interesting facet of the VC6096 is that it is based on Windows Mobile, and could conceivably be the largest Windows Mobile 6 device yet. In terms of in-car computer systems, however, it's actually quite small at 9.53" x 9.25" x 1.95" with a 6.5" VGA touchscreen. It can be connected to an SAE J1708 or SAE J1939 telematics bus to work in tandem with fleet management or vehicle tracking systems, and has a SiRFstarIII GsC3ef/LP GPS chipset, GSM HSDPA, 802.11 a/b/g, and Bluetooth 2.0. Its wireless LAN supports WPA2, WEP (40 or 128 bit), TKIP, TLS, TTLS (MS-CHAP), TTLS (MS-CHAP v2), TTLS (CHAP), TTLS-MD5, TTLS-PAP, PEAP-TLS, PEAP (MS-CHAP v2), AES, and LEAP.